Now you can soak up the rays in more ways than one. These glasses have photo-voltaic cells on the lenses. You can see through them, but they convert sunlight to electricity and use it to charge your battery operated gear. The glasses, called SIG, or “Self-Energy Converting Sunglasses”have solar cells made of dye on the lenses. There is a cord that comes off the arm of the glasses and plugs into your power hungry gadgets to provide them with a free recharge. 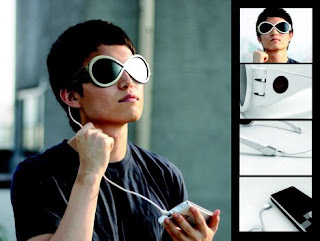 While I'm more of an Oakley guy, I've got to admit this technology has got me interested. It would be nice to spend some time pool side and not worry about losing the charge on the phone or iPod. I can't find any information on when they'll be available or the rumored cost, but if I find out, I'll let you know.